A few days ago I visited the bell tower of Leuven University Library (located on Ladeuze plein). The tower hosts one of the largest carillons in Europe (it even was the largest for some time). Normally the tower isn’t accessible to the public, but it’s possible to visit it once or twice a year, with the excursion to carillon followed by a nice concert of carillon music. 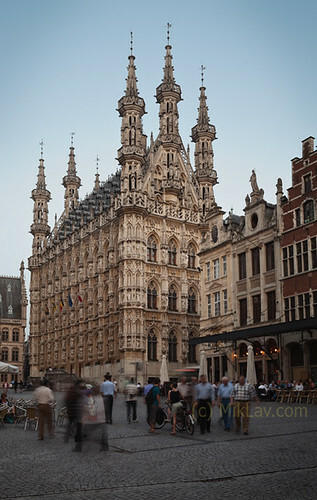 The excursion was lead by Luc Rombouts, carillionist and the official bell ringer of Leuven. The picture above shows the University Library with the tower photographed in twilight (more than a year ago). We visited the tower under bright daylight, and almost whole Leuven can be observed from the tower. And here is the rest of it. To continue on previous post – a few pics from Oude Markt in Leuven. Oude Markt is a nice medieval square in the center of the city. Cobblestone surface, old buildings on all 4 sides full of cafes, bars and restaurants. You can see how it looks in a usual week day evening. I didn’t realize that I have too few pictures of my home town until I got a request from a customer a few weeks ago. Luckily the weather is nice lately so I went to the center of Leuven to take some pictures. 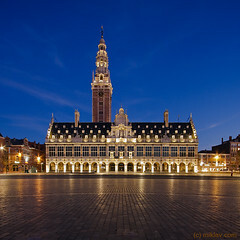 The City Hall of Leuven is nice, so I took some photos at the end of the day, when the lights started to turn on but the sky wasn’t completely dark yet. I went also to Oude Markt the same day. 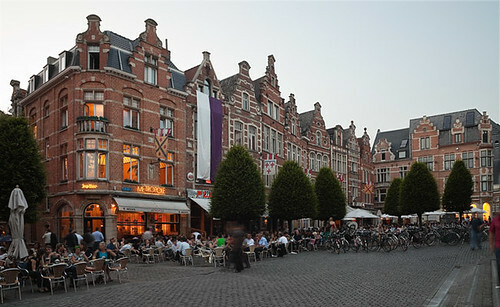 For those who doesn’t know Leuven Oude Markt is a nice old square surrounded by medieval buildings – it is full of bars and restaurants and some people call it the “largest bar in Europe”. It will be the subject of my next blog post. Belgian photographer Bert Stephani has published in his blog an invitation to Canon Discovery Days in Anderlecht with free workshop that Bert will conduct. The event will be in Dutch and French. Canon EOS 5D Mark II starts appearing in the shops. B&H has it listed for $2,699.95 with indication that they expect it in the beginning of December. Checking German portal idealo I found several listings for around 2,200 Euro with camera not being available; but there is one entry for 2,400 Eur and two for 2,500 Eur showing the camera is available from stock. So I hope we will soon see the hands-on reviews and tests of Canon EOS 5D Mark II. For those living in Leuven – note that the city hall services are moving from the center of the city to the new office next to the railway station. They will be open at new address from the 2nd of December. Design based on Europe theme made by LaSet.